As we all know, Google is about to launch new Pixel phones in their event on the 4th of October. But recently, we had a good look at what each device actually looked like. Over the past two days, Evan Blass has leaked out two new renders of the Pixel and the Pixel XL, giving us a better idea of what to expect. Both phones are going to look pretty much the same with nothing more than a half-inch of screen separating them. With that said, how do these two devices compare in size? Obviously, the 5-inch Pixel is smaller than the 5.5-inch Pixel XL, but it’s tough to get a feel for the size based on that spec alone. The image above gives us an idea of how much bigger the XL will be, but there’s still nothing to compare to. Luckily, Android Central did the math to figure out, to scale, exactly how big the Pixel and Pixel XL will be when compared to the Nexus 5X and the Nexus 6P. 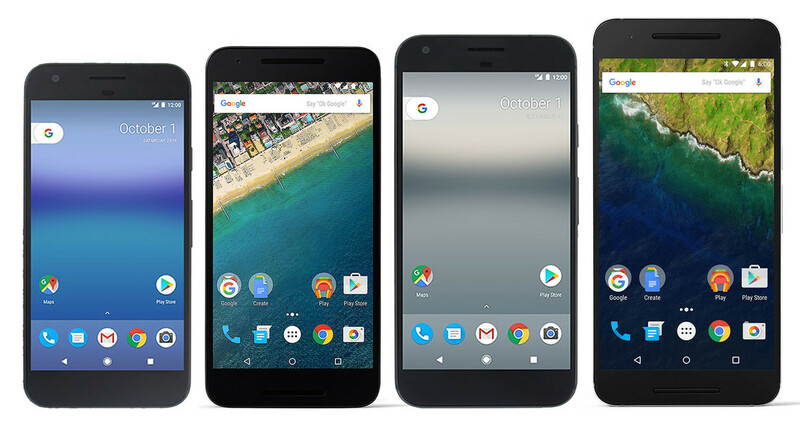 In the image below we see, from left to right, the Pixel (5-inch), Nexus 5X (5.2-inch), Pixel XL (5.5-inch), and the Nexus 6P (5.7-inch). Compared to the Nexus devices, it’s quite impressive how much Google has trimmed down the overall size of these smartphones. Many have complained about the large bezels on the Pixel, and rightly so, but at least we see here that it’s not making a huge difference in overall size. The most impressive comparison, in my opinion, is between that of the Nexus 5X and Pixel XL. Despite a .3-inch difference in screen size, the Pixel XL’s footprint is barely larger. Phandroid also put the Pixel devices into a size comparison with not only the 5X and 6P, but also several other Android smartphones such as the Galaxy S7, S7 Edge, and LG V20. All will be revealed with both of these smartphones, and much more, at Google’s October 4th unveiling, so stay tuned!